Picture the scene: you are an overseas visitor who is coming to the end of your trip to Catalunya and you would like to pick up a gift for friends, family or maybe even for yourself. You want something that is stereotypically Catalan or Spanish, but you are hampered by not knowing where to go and are devoid of inspiration. But all is not lost. Our clients regularly ask us for guidance, so we we have decided to dedicate two blog post to this topic, sharing our suggestions and where to source them from in Barcelona. As Spain has an incredible array of food and drink carrying the Denominació d’Origen (D.O.) classification, what better place to start with our recommendations. Spain is famous for its wines. Who could resist a full bodies Rioja or Ribera del Duero? But did you know that Catalan wine has nine distinct D.O. region, one Denominació d’Origen Qualificada (D.O.Q.) region (the Priorat), plus all other wine produced in the region falls under the generic Catalunya D.O. appellation? Consequently, the gift of wine would be very representative of the produce of Catalunya! As you would imagine Barcelona is filled with excellent wine retailers. One of our favorites is Vila Viniteca – Vinos, situated in the El Born neighborhood. 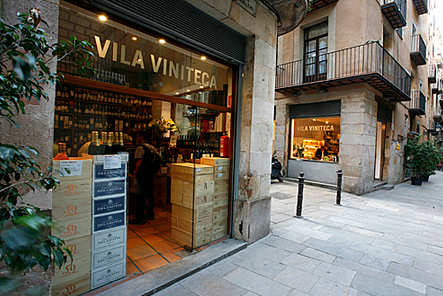 Vila Viniteca – Vinos: Address: Carrer Agullers 7, 08003 Barcelona. Metro: Jaume I or Barceloneta (both L4/Yellow Line). Website: www.vilaviniteca.es. Online Shop: Delivers to Germany, Austria, Belgium, Denmark, France, Italy, Luxemburg and the Netherlands, as well as Spain. More alcohol, but this time vermouth, or vermut! As mentioned in our recent blog post on the subject, sweet Spanish vermut is currently undergoing a renaissance, with a fresh crop of vermuterías springing up alongside more traditional establishments. 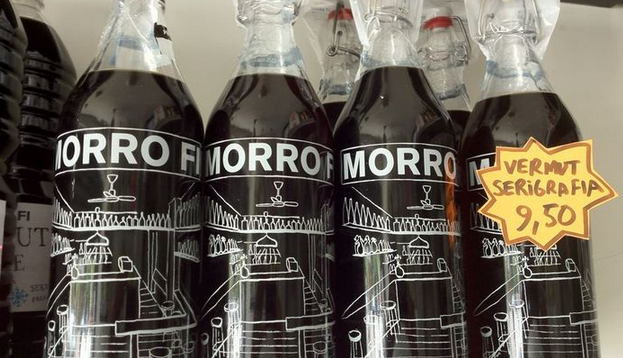 One of our favorite of this new generation is Morro Fi, who not only serve an excellent vermut de la casa, but their online shop delivers worldwide and their funky branding, designed by local graffiti artist El Xupet Negre, is a thing to behold. Morro Fi: Address: Carrerr Consell de Cent 171, 08015 Barcelona. Metro: Urgell (L1/Red Line). Website: www.morrofi.cat. Online Shop: International deliveries. Although Catalunya is not synonymous with the production of cured hams, jamón ibérico, is as popular here as in the rest of the Iberian Peninsular. Typically made from Black Iberian pigs, the most delicious and prized is the acorn-fed variety (jamón ibérico de bellota), and along with cured sausages, such as chorizo, are much-loved tapas plates. For a locally produced, cured sausage look out for fuet from the Catalan province of Osona. Cured hams and sausages are easily available in most markets and grocery stores. Why not try Mas Gourmets, who have 11 locations in Barcelona, including five stores in the city’s famous La Boqueria market? 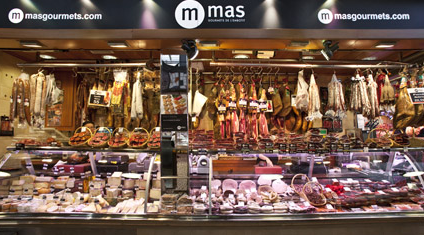 Mas Gourmets: Address: La Boqueria, Rambla S. Josep 101, 08001 Barcelona. Metro: Liceu (L3/Green Line). Website: www.masgourmets.com. Perhaps the most famous of Spanish cheeses is manchego, but there is a world of cheeses that are coming to international attention, not least the recent Spanish winners of the 2014 World Championship Cheese Contest, held in Wisconsin, USA. 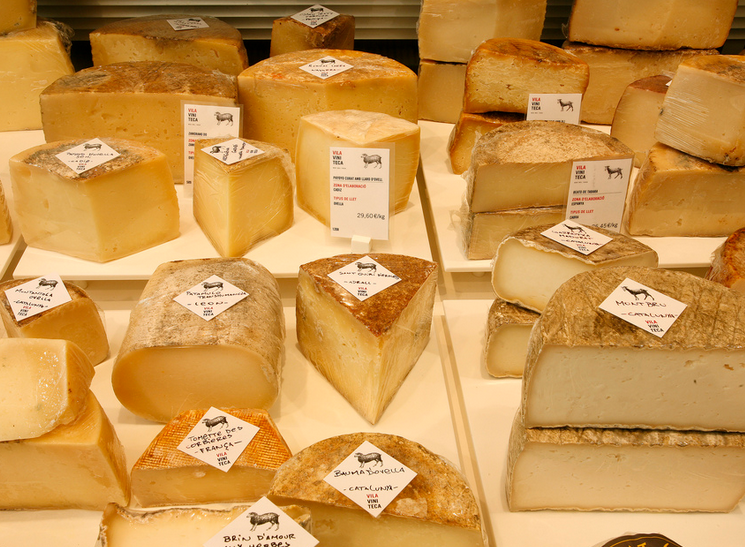 You can purchase cheeses from most of Barcelona’s markets, however two of our favorite locations for purchasing locally produced, artisan cheeses are Formatgeria La Seu (Gothic Quarter) and Vila Viniteca – Gastronomía (El Born). Formatgeria La Seu: Address: Carrer Dagueria 16, 08002 Barcelona. Metro: Jaume I (L4/Yello Line). Web: www.formatgerialaseu.com. Vila Viniteca – Gastronomía: Address: Carrer Agullers 9, 08003 Barcelona. Metro: Jaume I or Barceloneta (L4/Yellow Line). Website: www.vilaviniteca.es. These two most basic of store-room cupboards might seem like an unlikely suggestion for a gift, but when you enter into a boutique dedicated to the ingredients that form the bedrock of Mediterranean, such as Oli Sal, you will soon change your mind! 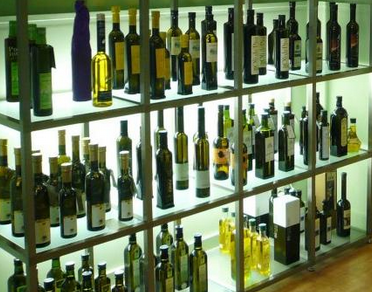 Products include a very impressive range of oil olives, salt from Ibiza as well as a great selection of vinegars, many of which you can sample before you can purchase. Look out for their travel friendly gift packs. Oli Sal: Address: Travessera de Gràcia 170, 08012 Barcelona. Metro: Fontana (L3/Green Line) or Joanic (L4/Yellow Line). Website: www.olisal.com. Online Shop: International deliveries. You only need to look as far the city’s chocolate museum to know that Barcelona has had a long love affair with chocolate, stemming from when it was first introduced to the city from the newly discovered Americas in the 16th Century. Building on this tradition, unsurprisingly there is a number of high-end chocolate brands to choose from. One of our favorite’s is Chocolate Amatller, who have been established since 1797 and who’s vintage packaging designs are works of art in themselves. Although they do not have a specific outlet in the city, you can find their refined chocolates in many small stores across the city, such as Pastisseria La Colmena in the Gothic Quarter. Pastisseria La Colmena: Address: Plaça de l’Àngel 12, 08002 Barcelona. Metro: Jaume I (L4/Yellow Line). Website: www.pastisserialacolmena.com. Online Shop: International deliveries. – Make sure you purchase items with packaging that will not break in transit. For food stuff, such as cured hams/sausages and cheeses, opt for vacuum packed items. – If you do not want to use up valuable luggage allowance consider ordering online to have items shipped overseas. Look out for part two of this series, for yet more great suggestions. 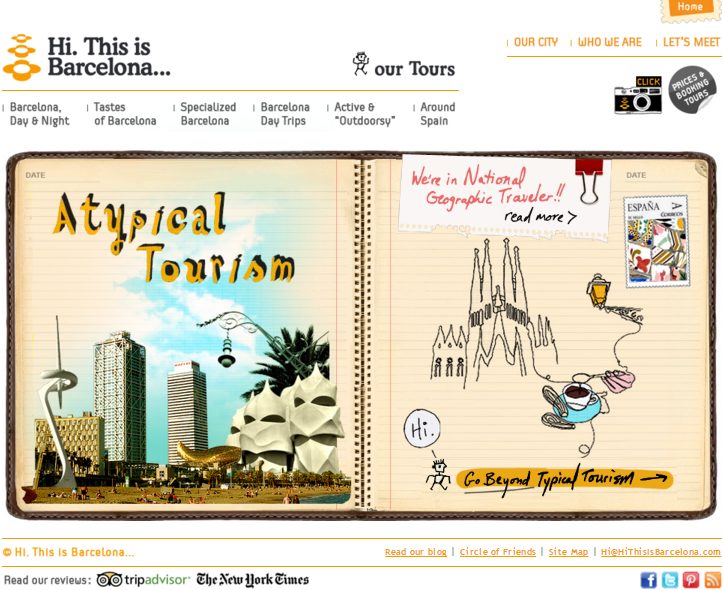 This entry was posted in Barcelona and around, Food and Drink, Gifts and Souvenirs and tagged Barcelona, Barcelona Shopping, Catalonia, Cheese, Chocolate, Drink, Food, Gifts, Ham, Olive oil, Salt, Sausages, vermouth, vermut, Wine. Bookmark the permalink. ← Riding High – Why did Barcelona Boom?